Summary: Niseko Hanazono doesn`t have the notoriety, trail system, lift infrastructure or night-life of neighboring Hirafu, but that`s just fine with us. Less crowds, amazing snow, excellent backcountry access points, great lodge and two of Niseko`s top instruction/guiding companies housed at the base make Hanazono one of our favorite Niseko United ski resorts for early morning freshies and slopeside apres ski beers. Located on the north-eastern flank of Mt. Niseko Annupuri, Niseko Hanazono has the smallest trail system, fewest lifts and some of the mellowest groomed terrain of all four Niseko United Resorts. Sounds like you should skip Hanazono and stick to the other three resorts right? By all means, please do…that`ll leave the hidden goodies for us. What Hanazono lacks in size compared to its neighbors it makes up for with great snow quality, fun easy access tree runs and a host of other desirable traits that make it one of our favorite Niseko resorts to start and finish a pow day. You`ll need to stay in one of the other villages as Hanazono doesn`t have on-site accommodations, but no worries. We recommend the super swanky, surprisingly affordable Kizuna Apartments in the Hirafu Upper-village as there`s a free Hanazono shuttle-bus stop right outside the front door that`ll bring you to and from the powpow between 7:50am-5:10pm everyday. Along with wide trails for lower and mid-level skiers & snowboarders, Hanazono is home to a multi-stage terrain park, excellent Hanazono 308 base lodge and some of the best boundary exits into blissful Niseko pow you`ll find anywhere across the four resorts. Hanazono Powder Guides (HPG) are Niseko`s go-to backcountry pros that`ll show you those memorable stashes right after the sun comes up, while NISS (Niseko International Snowsports School) is arguably the top snowsports education firm in the Niseko United family to get you happily sliding more confidently. Both companies are conveniently located in the Hanazono 308 lodge. Hanazono also has privileged positioning as early morning snow stays protected from the wind and sun (begins on the other side at Niseko Annupuri), while end-of-day rays bathe the Hanazono 308 Lodge in orange glows that make it the perfect spot to finish-out your final runs of the day. Advanced piste-bashers looking for challenging slopes won`t find them at Hanazono, but that`s just fine with the happy families, kids, beginners and intermediates that love the nearly 800 vertical meters of mellow cruiser trails ending at the Hanazono 308 Lodge. Freestylers will definitely fit-in at Hanazono. There are three parks — located on Upper Stairway to Heaven (2) and Lower Silver Dream (1) — with bumpin`beats blaring over the loudspeakers and features ranging from beginner to expert. 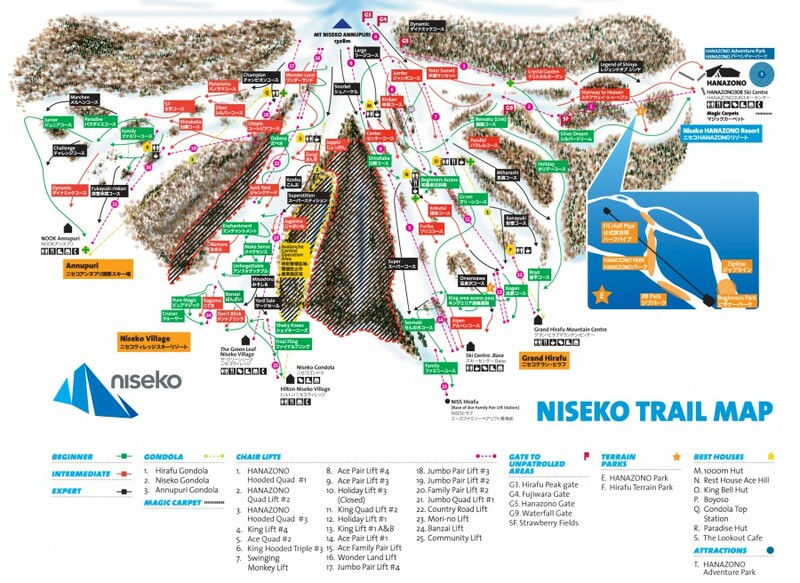 Trail map views of Niseko Hanazono don`t do the place much justice as you`ll be surprised by the fun tree runs within the boundary. But the real Hanazono pow isn`t officially Hanazono pow…or is it? Hanazono`s greatest attribute in our view is that sidecountry/backcountry access is excellent and with HPG`s First Tracks Program, you`ll quickly discover that just because Niseko`s excellent terrain outside the boundary isn`t officially Hanazono Resort`s, it sure feels like it. Another great attribute of Hanazono Resort is that crowds are smaller than at connected Grand Hirafu. Lines can be long at the Hanazono Hooded Quad #1 on powder-filled mornings, but you won`t see overwhelming hordes of people bottling-up the trails throughout the day. 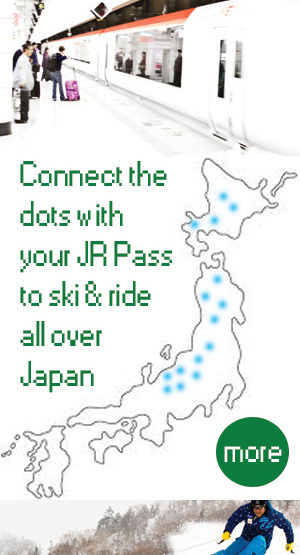 Holidays are busy, but it`s snow-covered (up to your eye-balls) Niseko…er, Australia…er, Niseko after all. The lifts at Hanazono aren`t very efficient in our opinion. Redundant is a word that comes to mind…just too much wasted time on a total of only 3 lifts that could be solved with a more effective system that uses less lifts from bottom to top. But realistically, the inconvenient segmentation of the lifts probably helps disperse crowds better, allowing for a lot of elbow room on your ride down. *Car recommended: If staying in Hirafu, a car is not recommended, but otherwise it`s helpful from Niseko Village, Niseko Annupuri or other parts of Western Hokkaido. 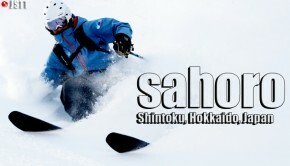 Is playing in Niseko`s trademark powder before everyone else can even ride the lift in the morning important to you? Silly question right? Hanazono Powder Guides are one of the top backcountry skiing & snowboarding guide services in all of Japan and have a special deal that only they can offer. 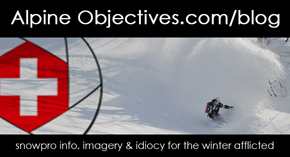 Find out how to be first and have the last laugh in Niseko with HPG. 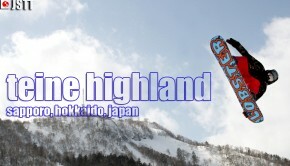 We love Japanese culture and their strong connections to centuries-old cultural heritage, but the language barrier at Japanese ski areas can be problematic if you`re looking for English-speaking ski & snowboard instructors. 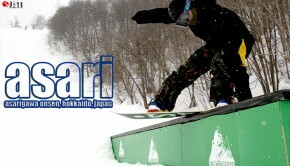 Similar to the reputation of HPG, the Niseko International Snowsports School (NISS) is one of Japan`s top English speaking ski & snowboard schools. All levels of skiers & snowboarders can benefit from the technical expertise of NISS, as well as from their local knowledge inside the Niseko boundary on pow days. Hanazono 308 — named for its elevation at 308 meters — is an excellent base lodge facility at the bottom of the Hanazono slopes. Hanazono 308 is home to HPG, NISS, top-brand retail/rental/repair shop and very good cafeteria-style restaurant that serves some of the best ramen (with crab legs) you`ll eat anywhere in Japan. The 308 lodge is a great place to start a pow day, stop for lunch and finish your day under the setting Niseko sun with an apres ski beer. If you`re not really in the mood for a full-blown meal or rest during your powder day at Hanazono, drop by the Hana 1 Cafe instead for a quick hot-drink or snack located right next to the Hanazono Hooded Quad #1 at the base. Hanazono Resort doesn`t offer lodging, so most guests who spend their time inside and outside the Hanazono boundary stay in Hirafu Village. Hanazono makes it easy to get early morning freshies and last runs of the day with a free shuttle to/from upper-and-lower Hirafu Village. The shuttle can cram around 8-12 people with skis/boards and runs daily every 20 minutes from 7:50am-5:10pm. If you want the best of all worlds at Niseko — easy Grand Hirafu gondola access with interconnected ski trails to Hanazono Resort, a Hanazono shuttle stop out front, convenient location within walking distance to Hirafu nightlife & restaurants and flat-out one of Niseko`s best accommodations — reserve a room at the beautiful Kizuna Apartments in Niseko Grand Hirafu upper-Village.